Is your commercial or industrial roof old, worn or experiencing chronic leaks? New View Roofing offers commercial and industrial roof coatings to create a watertight barrier that prevents damage from sun, wind, rain and more. 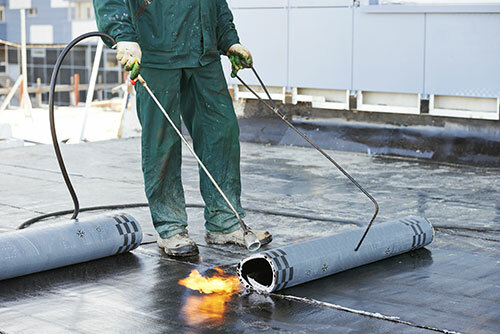 Our roofing contractors are experienced in waterproofing and sealing many types of commercial roof systems, including metal, asphalt and single-ply. A coating can add energy-efficient roofing properties to your facility by countering the effects of the Texas heat below the surface of the roof. This cools the internal temperature and can even lower the cost of energy bills. Talk with one of our certified team members to learn more about the benefits of commercial roof coatings. Contact the Coating Specialists at New View Roofing! Our commercial roof coatings are a cost-effective solution to roof replacement. New View Roofing is proud to offer a variety of commercial roofing services and energy-efficient roofing options. To find out more about our protective coatings and watertight seals for your commercial roof, call (469) 232-7220 or submit our online form. We’ll be happy to provide you with a free quote.